« Happy Birthday to my Favorite Auntie! 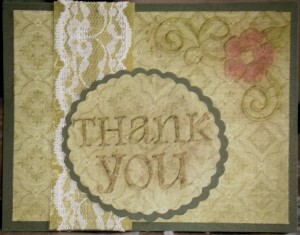 Today’s Midweek challenge over at OWH Stars and Stamps was to make a Fall Themed Thank You card… I started out with an Olive Green card base. Then I embossed a 5 & 1/8 inch by 3 & 7/8 inch piece of card stock with a sizzix embossing folder from the Thank You set, and used paper chalk to help the embossed image stick out. I then cut a 4 & 1/4 inch by 1 & 1/2 inch strip of paper and wrapped some old lace around it. Next, I designed a scalloped oval 3 & 1/8 inch by 2 & 7/8 inch and cut the oval from the base card stock material (olive green). Finally, I cut another scalloped oval (2 & 7/8 by 2 & 5/8), embossed that oval with “THANK YOU” and used my paper chalk again to make the embossing pop. As I was putting this card together, I kept trying to add oranges or yellows, and it just didn’t look right… I really like how this came out using the green tones throughout. This entry was posted on Wednesday, September 8th, 2010 at 2:26 PM	and is filed under Operation Write Home, Scrapbooking and Crafts. You can follow any responses to this entry through the RSS 2.0 feed. You can leave a response, or trackback from your own site. Jennifer, I like the old fashioned look of your card! Thanks for playing along with us at Operation Write Home! It qualifies as fall to me. The green and gold together are really attractive. Very nicely done! Thanks for posting. Beautiful use of that lace. Thank you for sharing! Your card is fantastic!